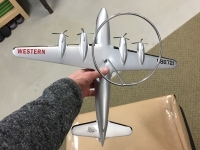 N88721 1/72 Western DC-4 N88721 Period 1950s wooden model. Meticulously restored using high grade automotive paints and high gloss clear double coat. Length 16 inches wingspan 20 inches. 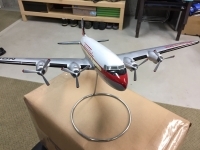 N8721 1/72 Western DC-4 N88721 Period 1950s wooden model. Meticulously restored using high grade automotive paints and high gloss clear double coat. Length 16 inches wingspan 20 inches. N7137C Original Raise Up model .. this Electra has been totally refinished by a top model guy in the UK. 1/60 scale all original Pacific Miniatures model. Titles say Boeing 720B, but the model itself is actually a Boeing 720. N93141 A beautiful museum grade restoration.